One of the primary reasons I started this blog was that the greater Upper Valley area suffers from a dearth of restaurants. I’ve long been surprised that many of the area towns lack a decent number of eateries, and for a long time downtown Lebanon has lacked a real breakfast joint. Rumors would occasionally swirl around about a place opening up (there was even talk of another location of the now-defunct Farmers Diner happening here at some point), but nothing ever materialized. Until last month. Andy Hill used to be one of the bartenders/managers at Salt hill Pub on the other end of the Lebanon Mall, and I remember him telling me a few years ago that what he really wanted to do was to open his own breakfast spot in the community. Well, after several years of planning, he and his wife (city councilor and former mayor Karen Liot Hill) were finally able to bring the plan to fruition, opening the Lebanon Diner on the west end of the mall (across from The Cave, in a location that’s been, in my time here, a smoke shop and an eyeglass shop). The diner itself is modest from the exterior (currently, it doesn’t sport much signage, although I suspect that will change soon), but inside, they’ve really nicely refurbished the joint, and the interior is basically your standard 1950s diner: think stainless steel and tile, and you’ve got the idea here). It’s a warm and inviting space, and like most of the diners I really like, the space is centered on the grill; you can watch them make your breakfast in front of you. Menu-wise, the selection at Lebanon Diner is a bit on the light side (hey, they are new, I’ll let them get their stride), but they’ve got the basics of your diner breakfast: pancakes, waffles, French toast, and the required scrambled egg and omelet dishes. But there are two standout selections that I thought were worth mentioning: the corned beef hash and the biscuits and gravy. I almost always start with one of those when I’m visiting a new place, since both of those dishes are the sort of thing that really show if a place has got what it takes. Neither is a terribly complicated dish, but both are particularly easy to screw up. And both, in the right hands, can be surprisingly good as well (for example, the corned beef hash at my beloved Al’s Breakfast is one of my favorite food items anywhere). With CBH, there’s always an important decision: home-made or canned. And home-made is almost always the way to go. Don’t get me wrong: a talent cook that knows how to properly fry up the canned stuff can make some good dishes around it, but the results are usually lacking. But making your own CBH brings its own challenges. I’ve had plenty of dismal homemade CBHs that were dry, mealy, and disappointing, making me long for the canned stuff. Just as often, inexplicably, a restaurant will go to all the trouble of dicing potatoes, grinding meat, and making spice mixes, going through all the right motions, but somehow end up with something that’s nearly indistinguishable from the canned stuff. So when a place goes to the trouble of making their own, I like to start with that. 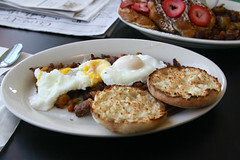 Lebanon Diner makes their own, starting every day with a fresh mix of corned beef, potatoes, spices, and herbs. I ended up ordering it as their standard breakfast item with two poached eggs. How was the hash? Well, they’ve got the basic idea well under control, in that they definitely aren’t just copying the canned product. Instead of having vague, red-tinted low-grade corned beef, this has had some nice, pleasant chunks of actual identifiable meat. The potatoes were nicely crisped, and the overall flavor was good, if subtle. Myself, I wanted a slightly moister CBH, and one with a bit more kick to it, but this was a good, solid CBH. I wouldn’t mind having it again, although if you note the picture, they are still working on getting the egg poaching down (to their credit, the staff noticed that before I did, and already got another egg going which they brought out shortly). Such are the trials of a new restaurant. For the record, I haven’t yet had the biscuits and gravy. That will wait for my next visit. I’ll let you know how it goes, but I’ve already heard good things from others. Carol did the French toast, and she did rather well, too. 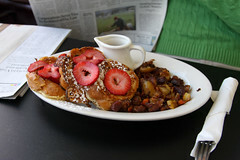 The French toast was nicely crisped on the outside, but still soft on the inside, and nicely flavored. She certainly seemed to enjoy it enough. Overall, I wanted to be a bit more wowed by the Lebanon Diner, but I’m very pleased they are here. They’ve got a nice spot that adds nicely to the downtown community, a pleasant staff, have already got a good clientele building up, and are putting out some good food. Work on the issues, and they’ll have a downtown gem on their hands. 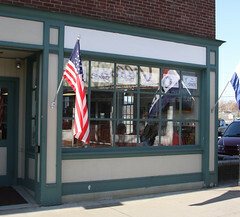 Anyone else in the Upper Valley, what have you thought of the Lebanon Diner? 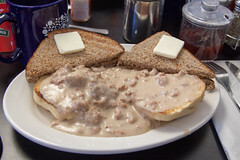 September 2012 Update: After having several people, including the owner of the diner, tell me that if I want to be “wowed” I should try the biscuits and gravy…. I finally made it back there to try them. These were actually quite good: the biscuits were decent (although I really, really need to just make biscuits to take to places around here, so they can see what they are missing), and the gravy really good: a homemade concoction with more than a little pork and spice. I was happy. Between this, and hearing that since they’ve been open for six months they are releasing a new menu, I’m happy. When you do get a chance to try the biscuits and gravy you won’t be disappointed. The first time I went they ran out of Hash and talked me into them. I don’t usually do white gravy but theirs is great, savory with just a hint of extra heat. See my edit above, I managed to finally try their biscuits and gravy, and I did indeed enjoy them. Best breakfast spot in Lebanon! The corned beef hash is excellent and so are the omelets. It’s worth a visit from wherever you are. I second EJ! 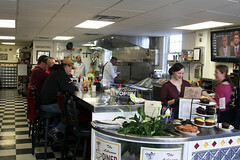 I love the food–beyond the corned beef hash, a big favorite is the meaty omelette with the local smoked cheese–but the ambience is really what seals the deal. So friendly and always playing great music. The place is a small town gem. I ordered the french toast there this morning and it looked absolutely NOTHING like the picture you have posted. I am actually quite jealous. What I got was fancy bread toasted on a grill. The only hint of egg was the bit of shell I picked off of the bread. There were no strawberries and no powdered sugar. I would understand if they were in the slightest bit busy, but they were not at all. Also, the home fries that my friend ordered were just cut up bits of potato placed on the grill briefly, completely unseasoned. Although they offered to take my meal off of the check, I am greatly disappointed in this diner. Sorry to hear that. Actually, I had breakfast there on Saturday morning as well, and my breakfast (hash and eggs) was quite nicely done (much better than the hash I had in this review, actually). Apparently the phrase “your mileage may vary” applies, as always. I’m not sure if they’ve changed the french toast since we got it, but I’m glad you gave some feedback. Well, after two days of testing in the Superstition Mountains, we were again hungry. This time, we decided to head back into Gilbert for a visit to Joe’s Farm Grill. Joe’s Farm Grill is the sister restaurant to the previous night’s Joe’s Real BBQ. Located just west of the corner of Ray and Higley in Gilbert, if you are in the area, Joe’s Farm Grill is hard to miss, since it has a rather large neon sign, and is basically a large “retro-futuristic” building nestled in amongst the citrus trees at the edge of a working farm. The farm isn’t a new thing, it’s been there since the 1920s, with the Johnston family being there since the 1960s. The restaurant is actually constructed around what’s left of the 1960s ranch house, although the renovation is so significant that you have to look carefully to actually find evidence of the original house (you can see some of this in the “fireplace room”).